When I finished medical school and residency in Seattle, I moved to Connecticut to take a job with an integrated medical practice. I worked at that office for about a year and a half and then decided it was time to open my own practice. I was just three weeks away from opening my doors, when I contracted Lyme disease. I had every symptom listed in the medical textbooks, including a throbbing headache, joint pain, numbness and tingling in my hands and feet, severe back pain, extreme fatigue and a 105 F degree fever. I even had the classic bull’s eye rash on the back of my leg. Once I saw the bull’s eye rash, I knew that I had Lyme disease. I started the standard treatment of doxycycline and after four days of treatment, was completely symptom-free and felt great… for about 8 months. After 8 months into starting my practice and working 10-12 hour days, I noticed I was getting numbness in my arms and back pain again. I chalked it up to just being overworked, but the symptoms worsened and then I started getting headaches, pain in my other joints and fatigue again. This was all too familiar and I knew I was relapsing with Lyme. Since it was in the dead of winter in Connecticut, it was unlikely a new infection. I took doxycycline again and there was no improvement. Over the course of the next 8 to 9 months, I continued changing antibiotic regimens and had no improvement. In fact, I was feeling worse and worse to the point I was having difficulty working. Things were not getting better. I was working with several Lyme-literate doctors in my area, yet I felt myself going deeper and deeper into poor health. The standard treatments had failed me, so I went back to my naturopathic roots. I finally went to see Dr. Zhang in New York City. Several of my other Lyme disease patients had seen him and had improved tremendously with his treatment. He treated me with acupuncture and his own Chinese herbal formulas and I started to feel better. Over the course of 6-7 months, my health improved dramatically and I was 85-90% back to my old self. My energy had improved, my headaches went away, the joint pain was gone and the numbness and tingling had dissipated. I hit a plateau and then switched to a modified Cowden protocol and that continued to help me feel better. I continued to work on my diet, getting better sleep, exercising more and doing all the lifestyle things I had been advising my patients to do. I had been studying with a homeopathic doctor who was kind enough to treat me and after she gave me a remedy, all my symptoms completely disappeared. It took almost three years to get better with plenty of ups and downs along the way, but I was finally able to live a Lyme-free life. People with Lyme disease often feel that antibiotics are the only solution to treatment, but my journey is a testament that it is not always the case. Some Lyme patients do very well with antibiotics and feel better. However, I have seen many people with Lyme who do not improve with antibiotics and like myself, sometimes get worse. I learned though my own experience that I wasn’t following my own advice to other Lyme patients and addressing my whole person. Once I started using natural therapies to work with my body instead of against it, I started to improve. I then focused on self-care and started getting better and deeper sleep, reducing my stress, ensuring my environment was free of mold and other toxins and exercising regularly. I even earned my black belt in karate 7 years after my initial Lyme diagnosis. I have since applied the same treatments to the thousands of Lyme patients I’ve treated, taking a whole person approach and not just focusing on killing the bacteria. Although it is important to control the Lyme bacteria, overcoming Lyme often involves doing all the little things that get overlooked in our day to day lives, such as eating clean, healthy food and practicing mindfulness. It’s not always easy. I struggled with doing many of the things I’ve asked other Lyme patients to do, but the results speak volumes. Our bodies have an innate wisdom to heal if we just give it the right tools to do so. Darin Ingels, ND, FAAEM is a respected leader in natural medicine with numerous publications, international lectures, and more than twenty-six years of experience in the healthcare field. He received his Bachelor of Science degree in medical technology from Purdue University and his doctorate of Naturopathic Medicine from Bastyr University. He has worked as a clinical microbiologist/immunologist at Lutheran General Hospital and is board-certified in Integrative Pediatrics. He is also a candidate for fellowship with the American Academy of Environmental Medicine. His practice focuses on chronic immune disorders, including Lyme disease, autism, allergies, asthma, recurrent or persistent infections, and other immune problems. Dr. Ingels uses diet, nutrients, herbs, homeopathy, and immunotherapy to help his patients achieve better health. 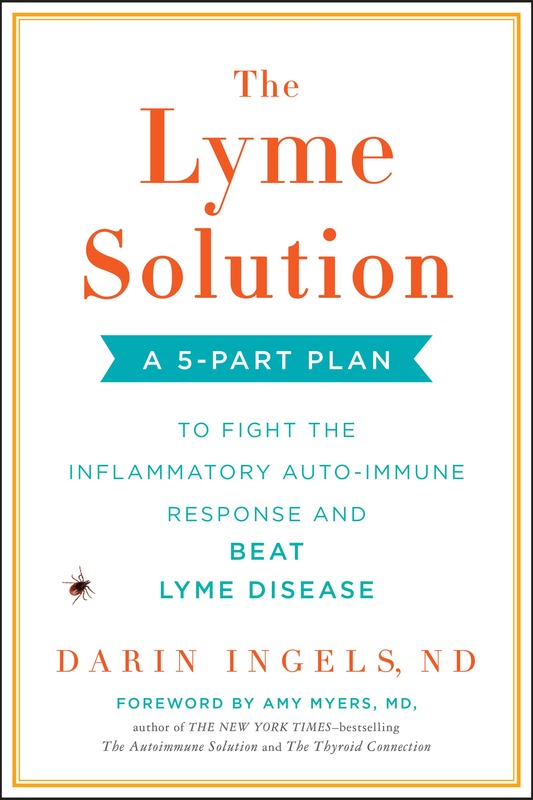 He is the author of THE LYME SOLUTION (on sale March 27th from Avery/Penguin Random House).